Edward Heath Williams is the wife of Maude Dunn and a son of James Horn Williams and Juliette Marion (Nellie) Heath. He is my maternal grandmother's father. Based on the age of the children, this picture was taken about 1895. According to the records of my maternal grandmother Mama Nelle Williams Holthouse. Click on this link to go to the Maude Dunn web page on the Dunn Family web site. Edward H. Williams. He whose name heads this brief sketch is one of Mississippi County's most active and enterprising business men, alive to all current topics, and public-spirited and progressive in all matters tending to benefit the community. He was born near Elmot, in 1859, his parents being James H. and Nellie Heath) Williams [for whose history see sketch of James H. Williams]. As Edward grew toward youth and [p.567] early manhood he attended school in the neighborhood of his home, and worked on the farm for his father until he was twenty-one years old, at which time he engaged as a clerk for A. Goodrich of Osceola, with whom he remained one year. After renting and tilling his father's farm for two years, he started from home with the intention of going to Florida, but stopped in Alabama, and attended school at Florence for some six months, after which he concluded that his native State was good enough to suit him, so he returned and went into business with D. T. Waller, which partnership was dissolved at the end of twenty months, Mr. Waller purchasing his interest. He then bought out N. W. Goodrich, and for two years was associated with A. Goodrich. purchasing his partner's interest at the end of that time; he has conducted affairs in a very satisfactory manner, proving himself to be a man of rare business ability and efficiency. He keeps an excellent assortment of general merchandise, his stock being valued at about $4,000, and has won the reputation of being one of the first business men in Mississippi County. He is enterprising and energetic, studying largely the interests of the people, and fully justifies the confidence and esteem which are bestowed upon him. 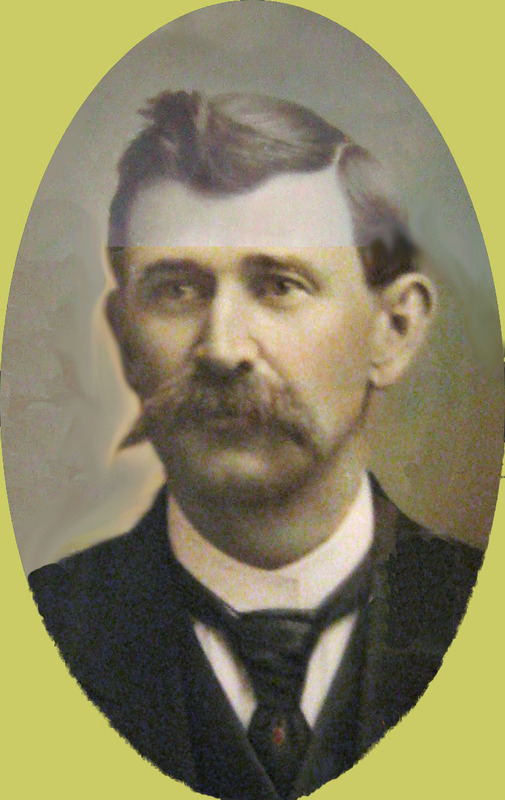 In connection with his mercantile interests he is managing his father's farm, growing cotton, and has been postmaster at Elmot since May, 1885. 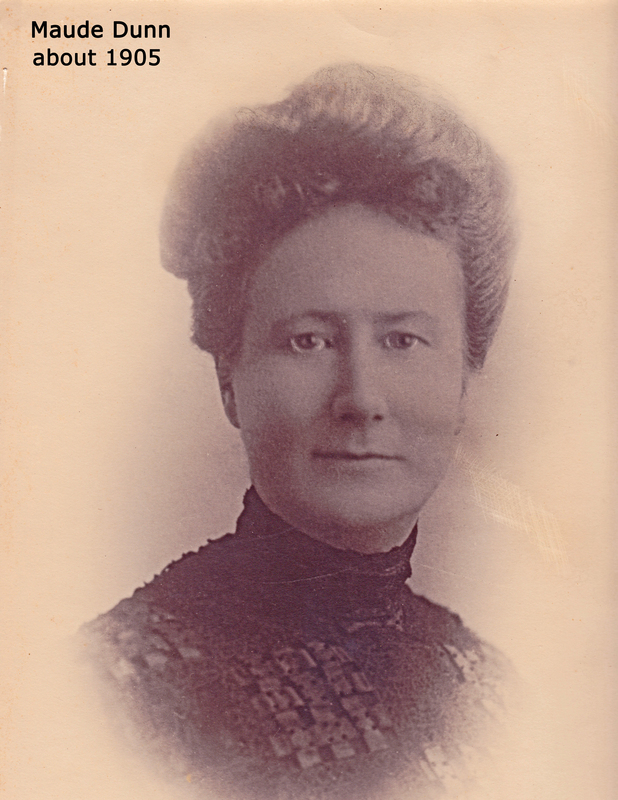 His estimable wife was formerly Miss Maude Dunn, of Pensacola, Fla., to whom he was married on the 17th of March, 1885, and by her he has one child, Edward James. Mrs. Williams is connected with the Catholic Church. Elmot is a postoffice five miles above Osceola, in Fletcher Township. It is the outlet for an excellent country, which is being rapidly improved and settled. The Government has been making extensive improvement along the river from and in the channel below, and this has given Elmot a rapid rise. The open land in this section is a continuation of the Osceola settlement, extending along the river in unbroken fields of the choicest land for nearly ten miles. Within a short distance on the river front are three stores and several landings, which have local names. Ed. Williams, proprietor of a general store, is also postmaster of Elmot. The following two letters were given to me by my Mother who got them from her Mother, the daughter of Ed Williams. I got here 4:30 yesterday eve. Am feeling rather blue over failure of my crop. I have been all over it this morn and will say I am blue over it and doubt it will make a crop unless it rains some more. Cotton needing rain also. No news. I will be giving more time this week. Can’t say when I will get home, likely any time. Love to all. Am so blue I am sorry I couldn’t deliver with a lot of land and money to get set. Elmot and Osceola, both in Mississippi County AR, are on the Mississippi River. Below is a picture of the River in that period. "Steamboat landing at Vicksburg. Sternwheeler Belle of Calhoun and sidewheeler Belle of the Bends." Detroit Publishing Company glass negative. The Belle of Calhoun was a 181-foot sternwheeler built at Carondelet, Illinois, in 1895. Named for Miss Anna Wood, who was crowned the Belle of Calhoun County, Illinois. Sank three times in her career, finally burned at Alton in the winter of 1930-1931. Belle of the Bends was a 210-foot sidewheeler. Built in 1898 at the Howard Yard in Jeffersonville, Indiana. 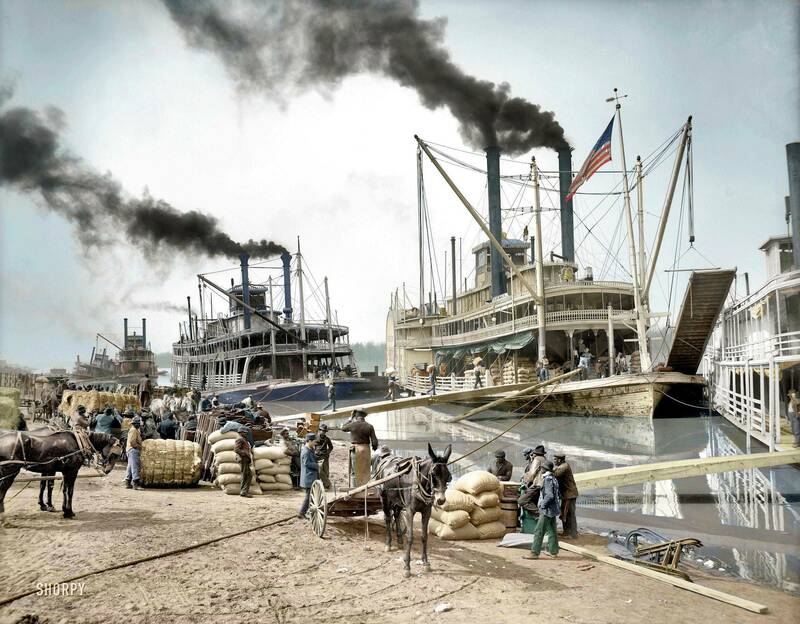 Converted to an excursion boat at Cairo and renamed Liberty circa 1918. Dismantled in October 1919. The wedding was held at the residence of Mr. and Mr. E. T. Dunn, North Palafox Street (Pensacola FL) with Rev. Father Tobin officiating. The attendants were Frank Maura with Clara Dunn, sister of the bride and W. H. Knowles with Lena Williams, sister of the groom. Following the service and the reception the couple left for Elmot, AR which was to be their home. Edward Heath Williams, born April 23, 1859, died Nov. 15, 1901, Osceola, Ark. He attended the local schools and worked on his father’s farm. At age 21 he became a clerk for A. Goodrich of Osceola where he remained for one year. After renting and tilling his fathers land for two years he left home with the intention of going to Florida, but stopped in Alabama, and attended school in Florence for about 6 months. He then concluded that his native state was good enough for him and he returned home. While traveling for his health he met a young lady who was on her way home after attending "finishing school" in Alabama - they met on a train. Edward was attracted to her and pursued her. Her father hired an agency in Memphis to investigate Edward's background before he allowed a courtship. Evidently the father was pleased with his findings and the young lady willing to be­come Mrs. Edward Heath Williams as they became man and wife. Maud Dunn Williams was born Nov. 2, 1865 in Quebec, Canada. She died in Muncie, Ind. June 29, 1918. Her home when they met was in Pensacola, Fla. They were married Mar. 17, 1885. 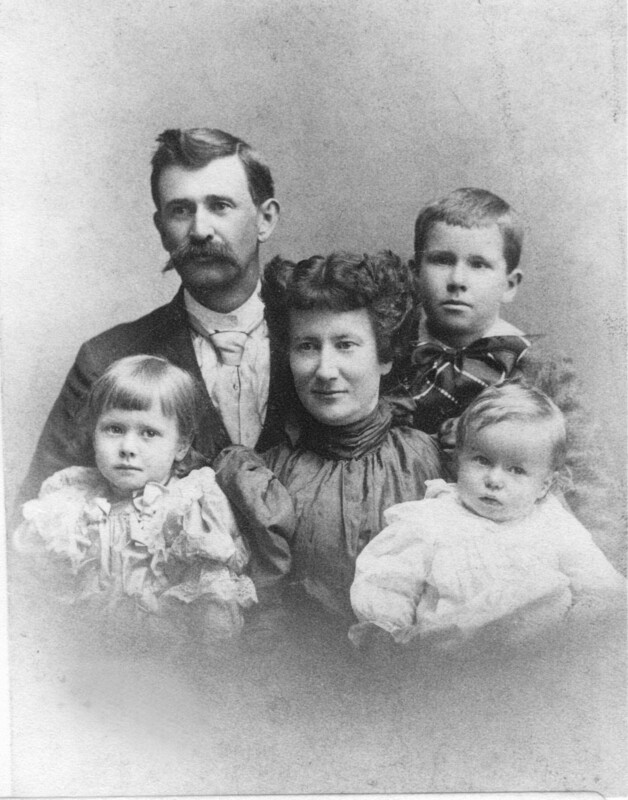 They were the parents of Nelle Williams born Oct. 29, 1891, married B.G.Holthouse . She died in Lawrenceburg, Tn. Oct. 13, 1973. She was born in Luxora, Ark. After their return to Arkansas he went into business with D.T.Waller. After about 20 months he sold his interest to Mr. Waller . He then bought out Mr. Goodrich for whom he had worked earlier. In connection with his mercantile business he managed his fathers farm, growing cotton and was postmaster at Elmot, Ark. Mrs. Williams was a member of the Catholic church. Edward was the son of James H. Williams who had been sent to Arkansas by his father in Nashville, TN to manage his farms, along with his wife and young daughter. He led a long and successful life in Luxora, AR just outside of Osceola on the Mississippi river. Ed prospered as a farmer and merchant in Luxora and Osceola, AR and was one of Mississippi county's largest land owners at the time of his death. He moved to Jonesboro, AR in 1900 and was in the insurance business there. In 1901, at 42 years of age, he died at home on Washington Street following nearly a month of fever and typhoid pneumonia. (He contracted pneumonia following a trip on horseback where he was caught in a rainstorm while looking after one of his farms according to family oral history). He was buried in the Jonesboro city cemetery on Sunday afternoon following the funeral at the Methodist Church. Relatives attending the funeral included: His brothers, Will Williams of Mariana, AR, and Henry Williams of Birmingham, AL. Henry is Ed's uncle, Henry Philips Williams who owned a large farm in Guthrie KY and lived for awhile in Birmingham AL. 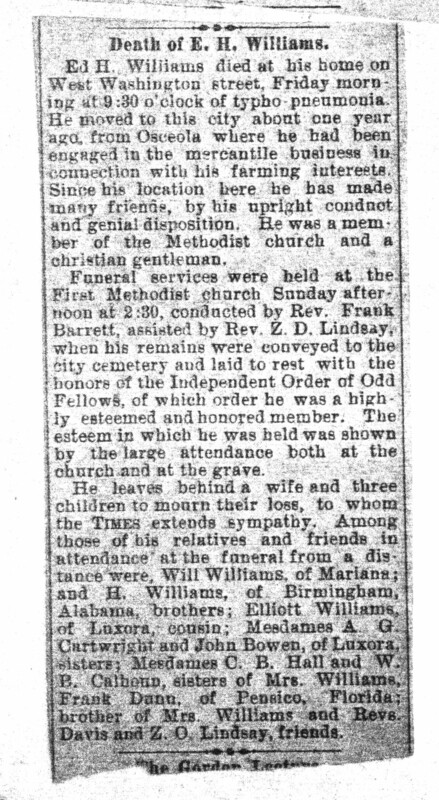 Cousin, Elliott Williams of Luxora, AR is the son of John W. Williams. John is the son of Williams Williams (brother of Ed's father James H. Williams). He had graduated at the Nashville University in 1841, surveyed land in Texas several years, read law, married Martha (youngest daughter of Graves Pennington of Davidson County TN) and then purchased a farm in Mississippi County AR. When his wife died he married Anna, eldest daughter of Col. Elliot Fletcher of AR. 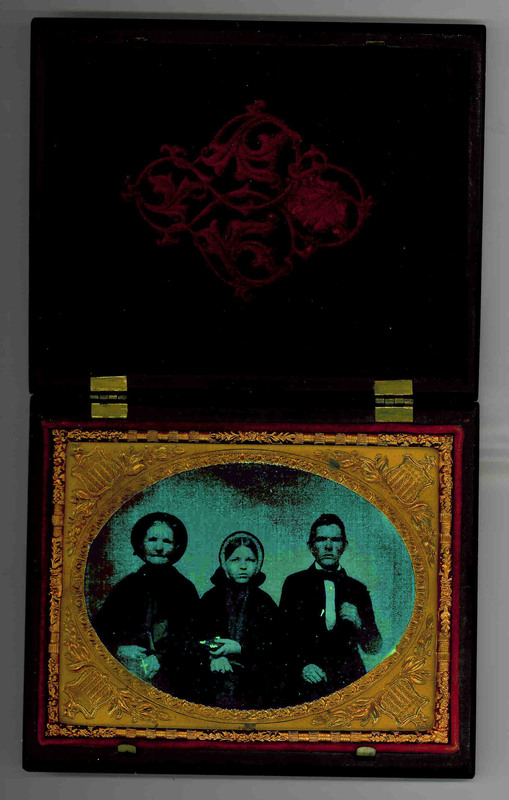 They had three children, Susan, Sally and Elliot. Mesdames A. G. Cartwright and W. B. Calhoun, sisters of Mr. Williams. Frank Dunn of Pensacola, FL, brother of Mrs. Williams. 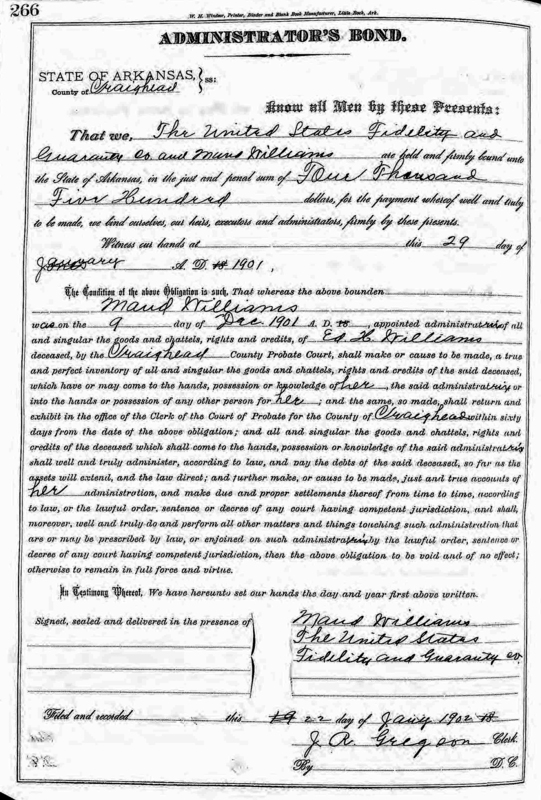 Ed Williams died without a will as evidenced by the document below, perhaps because he died young and unexpectedly. The below document shows his wife being appointed to handle the disposition of his worldly goods. There are additional records of how the probate was administered in the Craighead County Court records in Book D, pages 5, 7, 9, 11, 32, 35, 75, 102, 161, 168, 549, and 574. For whatever reason that Ed Heath Williams died without a will, his wife Nelle was required to post a bond to handle his probate. 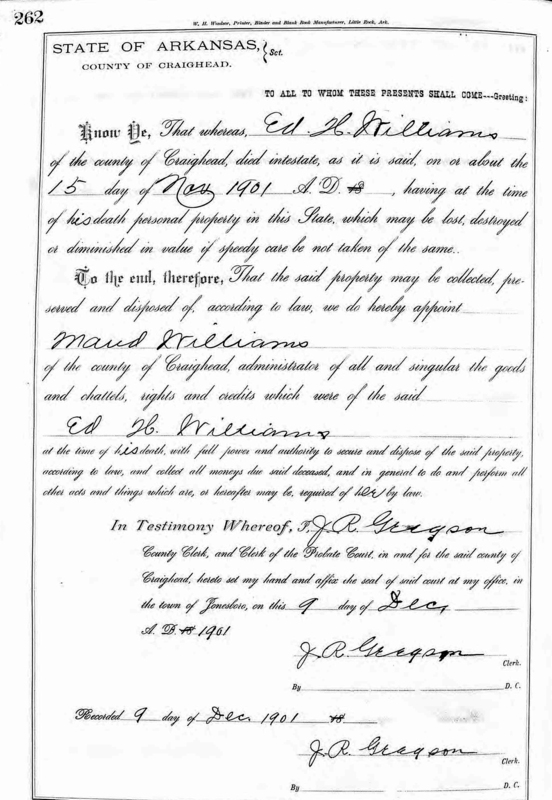 The below Probate records are available on Ancestry.com and are microfilm copies of the records as they appear in the Craighead County Arkansas County Court Records. The tin plate at the left was in the possessions of my Grandmother, Moma Nelle Williams Holthouse. I believe the picture may be of her parents, Edward Williams and his wife Maude Dunn about the time they were married in 1885. The older women may be Maude Dunn's grandmother. She appears to be too old to be her mother.